Ribbesford Downhill Track is located just outside of Bewdley on the edge of the Wyre Forest. It has been around since the early nineties and has been enjoyed by thousands of mountain bikers over the years. It Consists of 3 tracks named: Old Skool, Rib Tickler and Black Ribs. Old school has 2 big rollable jumps, the rest of the track has technical root sections and berms, this is the easiest run, great for beginners and seasoned veterans alike. The Rib Tickler is a fast paced single track run with tight corners, fast staights, flowing jumps, root section, a wooden North Shore feature and new for 2011 a step up step down jump. This track is aimed at intermediate and advanced level riders. Black Ribs is mainly a freeride route with lots of jumps, pumps, drops, step downs, big berms and is predominantly smooth and fast, aimed at the intermadiate and advanced rider. 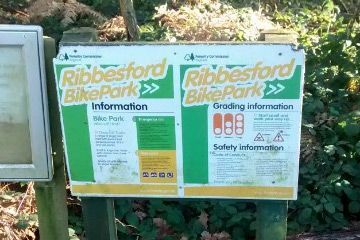 "fun for an afternoon if you're fairly local"
Ribbesford Bike Park 3.4 out of 5 based on 7 ratings. 7 user reviews.